This spectacular image of the Omega Centauri cluster was captured by the VLT Survey Telescope at the European Southern Observatory's Paranal Observatory in Chile. We're now more than halfway through spring. If you head outside during the evening hours and look skyward, you'll notice that the spring night sky is not as dazzling as the winter sky. Indeed, the brilliant stars associated with Orion and his retinue are all but gone, having disappeared into the sunset fires, not to reappear again until the predawn hours of mid-August. Summertime will bring a brighter firmament compared to spring, with the most spectacular parts of the Milky Way in view. In contrast, at this time of the year, the Milky Way is all but invisible as it runs all around the horizon — and is usually hidden in the haze that lies close to the horizon. The Beehive, or Praesepe — The late Walter Scott Houston, who spent much of his life observing deep-sky objects, once wrote that this beautiful open star cluster is "symbolic of spring." The Beehive lies within the dim constellation of Cancer (The Crab), which currently is located about one-third of the way up above the western horizon as darkness falls. Cancer, which is located between the stars Pollux and Castor in Gemini (The Twins) and the Sickle of Leo, is the least conspicuous of the 12 zodiacal constellations; some call Cancer the "empty space in the sky." Aside from being in the Zodiac, The Crab is probably only noteworthy because it contains one of the brightest galactic star clusters in the sky. This cluster appears to the eye as a fuzzy patch of light, although, under exceptionally clear and dark skies, those with better-than-average vision can almost resolve the cluster using just their eyes. Binoculars will reveal the cluster's stellar nature. In fact, through good binoculars and low-power telescopes, this cluster appears brilliant, with no sharp boundaries. The cluster's relatively new moniker — "The Beehive" — apparently first appeared almost four centuries ago, perhaps when some anonymous person, upon seeing so many stars revealed in one of the first crude telescopes, exclaimed: "It looks just like a swarm of bees!" Coma Berenices — Nearly overhead at around 10 p.m. local daylight time is the constellation that owes its name to a theft: Coma Berenices (Berenice's Hair). According to the story, Berenice was an Egyptian Queen in the third century B.C. who said that she would cut off her beautiful blonde hair if the gods would bring her husband home safely from a war. After her husband returned, Berenice kept her word, cut off her hair and placed it in a temple. But the hair was stolen and the queen was very upset, until local priests managed to convince her that Zeus had taken her golden locks and placed them in the sky as a constellation to honor her sacrifice. The Greek astronomer and mathematician Eratosthenes was among the first to notice this faint group of stars, which is a large, loose galactic cluster some 250 light-years away that appears as a faint shimmering patch of light on clear, moonless nights. In many ways, Coma Berenices seems to resemble a larger and more spread-out version of the famous Pleiades star cluster, which is also known as The Seven Sisters. As a cluster, Coma Berenices is by far at its best in a pair of good binoculars. If you attempt to observe it with a high-powered telescope, the impression of a cluster will become totally lost because of the telescope's narrower field of view. Algieba (The Lion's Mane) is in the curve or the blade of the Sickle of Leo, halfway up in the west-southwest sky at nightfall, and appears as a single star to the naked eye. However, as a moderate-size telescope (4 to 6 inches; 100- to 150-power magnification) will clearly show, Algieba is actually one of the most beautiful double stars in the sky. The Lion's Mane should really be observed in twilight or bright moonlight to reveal the contrasting colors; one star has been said to be greenish, the other a delicate yellow. Other observers, however, have described different hues, such as pale yellow; orange; reddish and golden yellow; and even pale red and white! Check it out for yourself: What colors do you see? Messier 3 — This is a beautiful and bright globular cluster, thought by many to be one of the most splendid in the sky. Messier 3 is located roughly midway between the brilliant orange star Arcturus and the third-magnitude star Cor Caroli in the constellation of Canes Venatici (The Hunting Dogs) and is currently soaring high in the south at around 10 p.m. local daylight time. The cluster was first seen by Charles Messier in 1764 and was listed as No. 3 ("M3") in his famous catalog of deep-sky objects. In a good pair of binoculars, M3 looks like a fuzzy sixth-magnitude star. But with a small telescope, it appears as a circular, nebulous object. The outer parts can be resolved into stars with a 4-inch (10 centimeters) telescope. Larger instruments will bring out the cluster's full glory: An 8-inch (20 cm) telescope at 200 to 300 power reveals a beautiful ball of countless tiny stars, with streams of stars seemingly running out from all sides. The 19th-century British astronomer William H. Smyth wrote: "A noble object . . . it blazes splendidly toward the center, with many outliers." Perhaps 40,000 light-years away, the cluster's diameter is estimated to be 220 light-years. 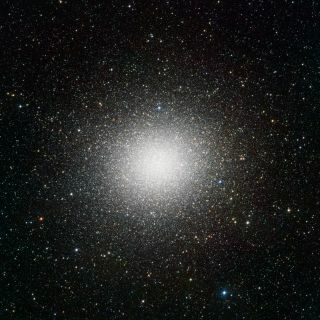 Omega Centauri — In the southern constellation of Centaurus (The Centaur), we have the brightest and most splendid globular star cluster in the entire sky. Shining at a moderately dim magnitude +4, Omega Centauri is easy to glimpse with the naked eye under good sky conditions. It has, in fact, been known since ancient times (albeit as a star), and it appeared in the star catalog of Ptolemy more than 18 centuries ago. The cluster even received the Greek letter designation of Omega from German astronomer Johann Bayer, who lived from 1572 until 1625. Edmond Halley (of comet fame) called Omega a nebula in 1677, but it was not until 1835 that its true glory as a cluster was revealed by the 18.25-inch (46.4 cm) telescope that Sir John Herschel took to South Africa to survey the southern skies. Of Omega, Herschel wrote: "It is beyond all comparison the richest and largest object of its kind in the heavens; the stars are literally innumerable." Omega Centauri is about 17,000 light-years away and probably contains more than 1 million stars. It has an apparent diameter equal to the moon — 0.5 degrees — but only appears about half as large as that to the unaided eye. This week this splendid object is almost due south at 10 p.m. local daylight time. Theoretically, Omega Centauri can be seen from places as far north as New York or Philadelphia. But I can offer no encouragement to those residents of the Big Apple or City of Brotherly Love, because even if all of their streetlights were somehow to be extinguished and a fresh, clean Canadian air mass were to position itself directly over the Northeastern U.S., the thick haze that is perpetually evident along and near the horizon almost always hides Omega. Furthermore, even if one were to somehow get it in view through a telescope, the cluster would be robbed of its full glory. To see this globular cluster properly, one should be no farther north than about 35 degrees north latitude, although a far better view can be obtained from the tropics, and especially near, or south of, the equator. Editor's note: If you have an amazing skywatching photo you'd like to share with Space.com and our news partners for a possible story or image gallery, send images and comments in to managing editor Tariq Malik at spacephotos@space.com.